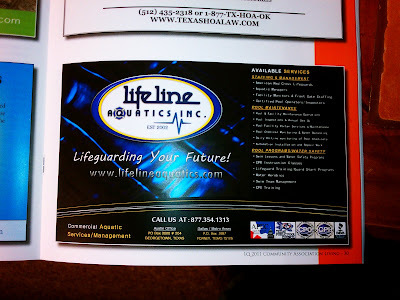 @JayJayasuriya: Lifeline Aquatics - "Lifeguarding Your Future!" Lifeline Aquatics - "Lifeguarding Your Future!" We are a full service Aquatic Management company located in the Dallas/Ft. Worth Metroplex as well as Central Texas and surrounding areas. We offer a one-stop solution for all your aquatic facility staffing and management needs. We offer Lifeguard Services, Aquatic Instruction, Front Gate Staffing, Certification Classes and Maintenance Services to our clients and their communities. As our clients and customers, you can sit back, relax and feel at ease knowing our team of professionals here at Lifeline Aquatics is "Lifeguarding Your Future!" Lifeline Aquatics is comprised of highly qualified aquatic professionals certified in the areas of serving and protecting lives as well as maintaining your aquatic facility! Our staff is held to high professional standards, with our clients' safety and satisfaction being our primary concern. Our background, experience, and knowledge guarantee our clients will get the most from their swimming experience, with a safe and secure feeling every time. Lifeline Aquatics exists to ensure that all communities have a safe swimming and recreational experience and to provide them with the opportunity to learn and apply valuable water safety skills.